Tropical Stormfront is Real-Time Strategy (RTS) game in a tropical setting. Take command and join the ultimate war of good versus evil. Defend your freedom against the forces of darkness. 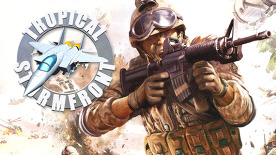 Fight real-time battles in the tropics and become the ultimate leader. The game features a multitude of pre-defined missions such as survival mode, eliminate all the enemy forces, capture the flag, hold the flag, defend against incoming forces, capture the enemy general, sea battles, air battles as well as tank fights.